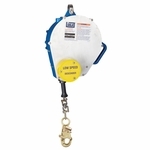 The Rollgliss Descent Device will get personnel down safely from high places when quick escape is vital. It offers a simple design that makes installation and use easy. No power tools or special skills are needed--simply connect to harness and step off the structure, it's that simple! You can use it over and over without factory servicing (inspect before each use). Made with either corrosion resistant galvanized or stainless steel cable for maximum longevity and durability. Two lengths to choose from.